The September program will be presented by Jim Wright. Jim's program will be on carving a face. 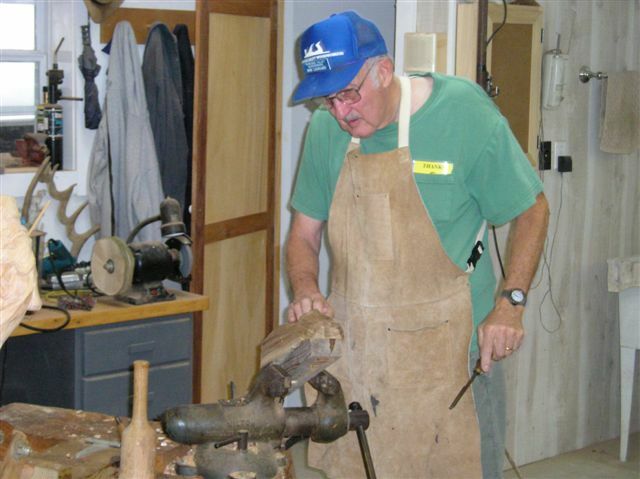 Jim is an accomplished carver who presents his craft with skill and humor. Come see this. 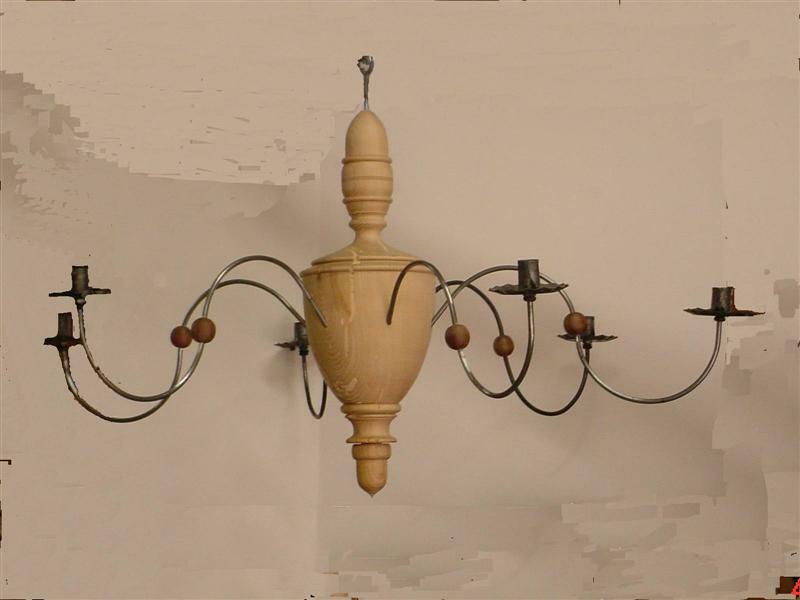 You'll enjoy watching a skilled craftsman/artist at work. 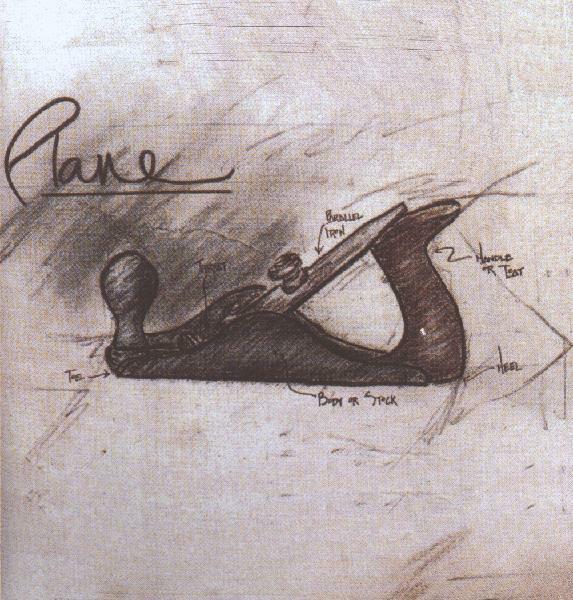 “HAND TOOLS FOR ADVANCED FURNITURE MAKING”. Make plans to attend this outstanding and informative Seminar. 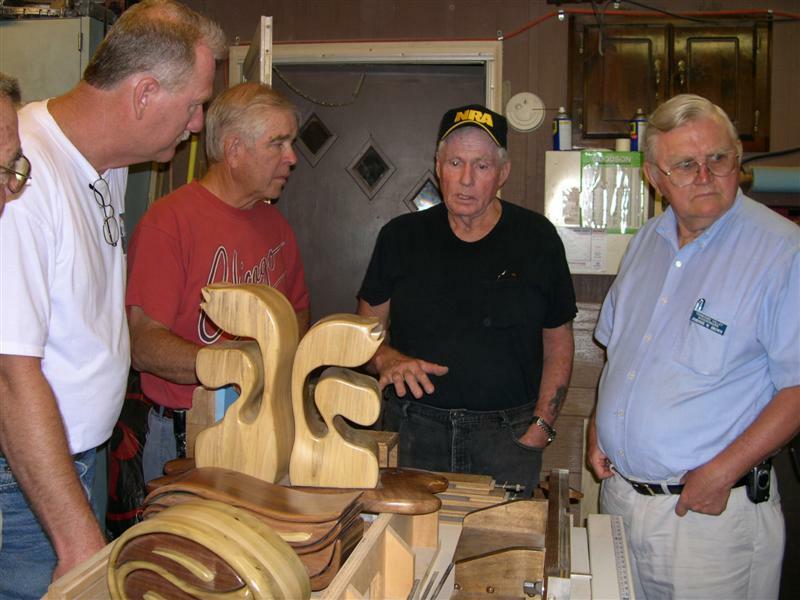 The August shop tour was held in the Manchester area. 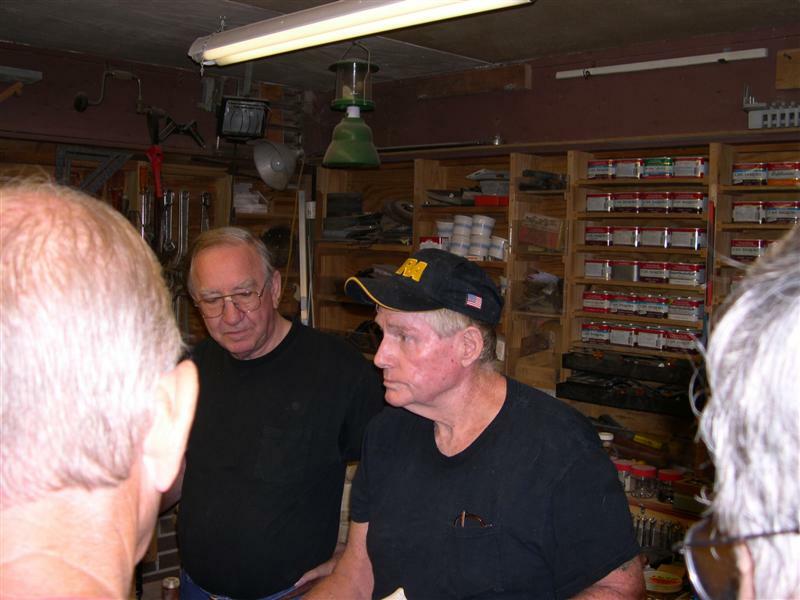 The shops on the tour included the shops of Johnny Brown, Bob Reese and David Whyte. About 25 members attend and enjoyed the tour. Thanks to the tour hosts and their willingness to “invite” the club into their shop. There will be no September shop tours, due to the club involvement in the Coffee County Fair activities. 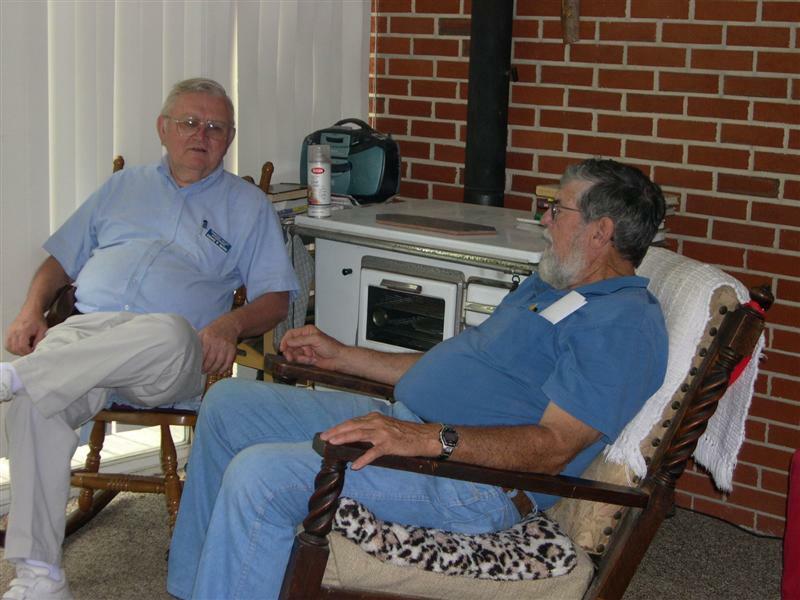 The August carver's meeting was again hosted by Jim Wright. Jim is teaching the carvers the proper techniques used to carve an “Indian bust”. Jim had a couple of carvings that were being used as examples. Since only a few of the carvers could make the last meeting, it was decided that everyone would finish their carving at home. Our club members are getting a lot of “press” lately. The latest TVW member, to be featured in a local newspaper, is David Whyte. David had a lengthy story in the Manchester Times last week. 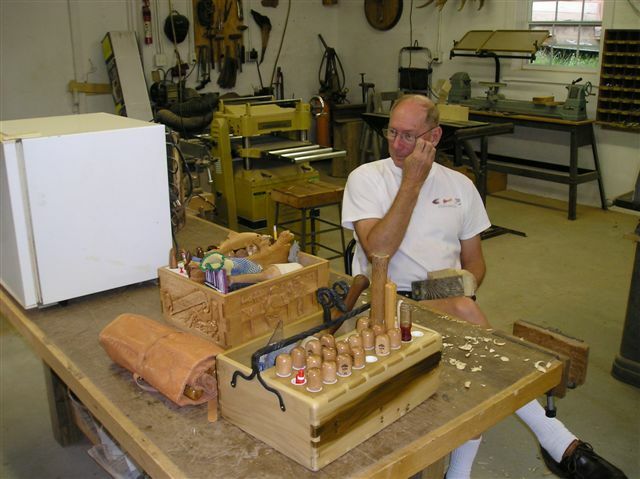 The feature of the article was his “Wood Art Sculptures” and the methods he uses to make his bandsaw boxes. It is no surprise that his “wood of choice” is walnut. The 2006 TVW survey results are posted on the homepage. Click here to return to the homepage and view the survey results. Thanks again to all members that took part in the survey. The Web site is being updated with the latest club news and events to help keep the members informed. Try accessing the Web site during the month to view the latest club announcements, news and activities. We still have club business cards available. For those who have not heard about our cards they are free to members and contain information about the club. The cards are designed so you can sign your name if you choose. See Henry Davis if you want a supply of cards or need to get some more. 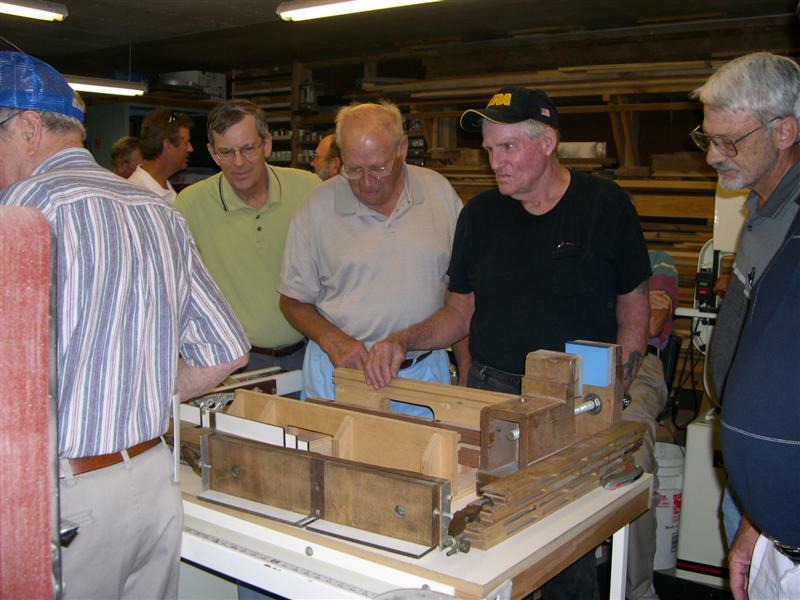 Henry Davis showed a video of a roll-around shop cart with a laminate top. Ross Roepke brought small jewelry boxes made from walnut molding. 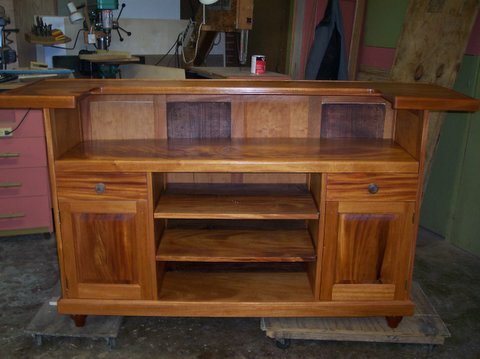 He also showed a small table with a curly maple top insert and pictures of the mahogany bar he recently completed. 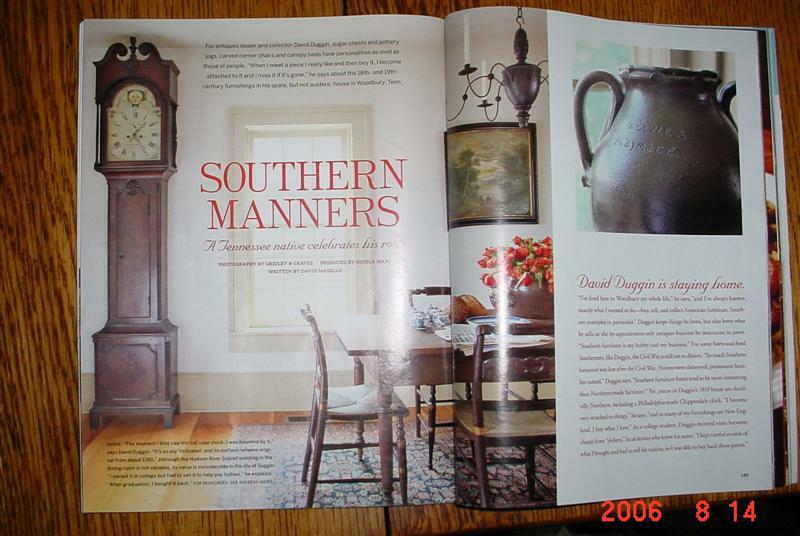 Doyle McConnell presented a slide show featuring the chandelier he turned from a piece of chestnut for the David Dugan house, which was featured in Country Living magazine. He also brought a copy of the Manchester Chamber of Commerce brochure showing his “Fibernochi”, which was purchased by the Manchester Arts Center for permanent display. 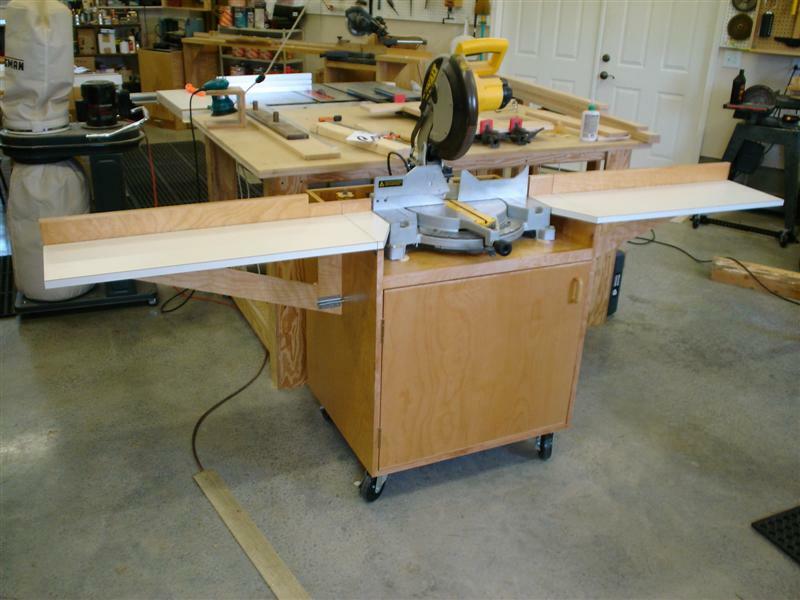 Dan Maher showed pictures of his mobile “chop saw” table. Maurice Ryan displayed a series of jewelry boxes, one featuring a mahogany insert. Chuck Taylor displayed a walnut jewelry box with decorative holly corner inserts and a sliding tray, also made of holly. 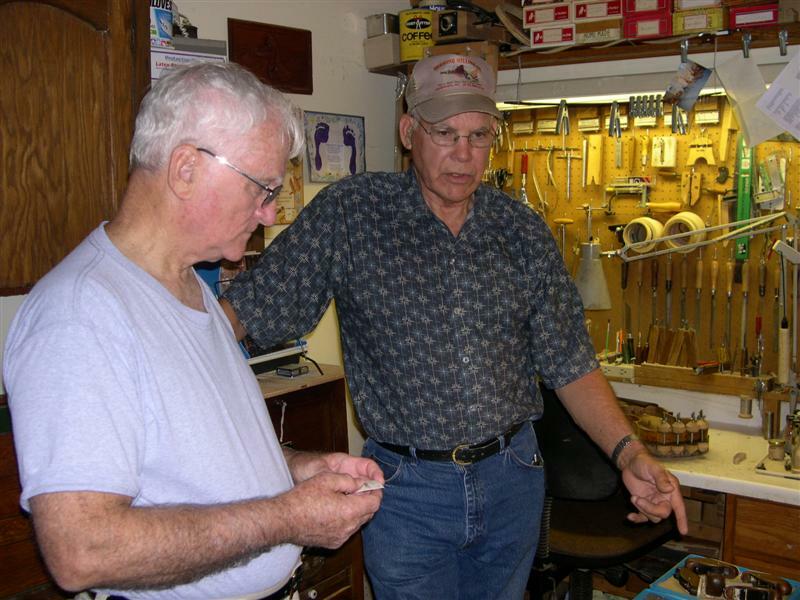 Bob Reese brought two bowls, one made of walnut and one made of red oak. Dave Whyte displayed another detailed “Wood Art Sculpture” bandsaw box made of walnut and poplar. Jim Accord showed his spalted wormy red maple bowl that he had roughed at the 2005 “turning workshop”. Bob Leonard brought his carvings depicting a cowboy and hillbilly caricatures. Billy May brought his detailed carvings of a Mountain man and the “GEICO” gecko. Jim Van Cleave displayed a dictionary stand that he recently completed. 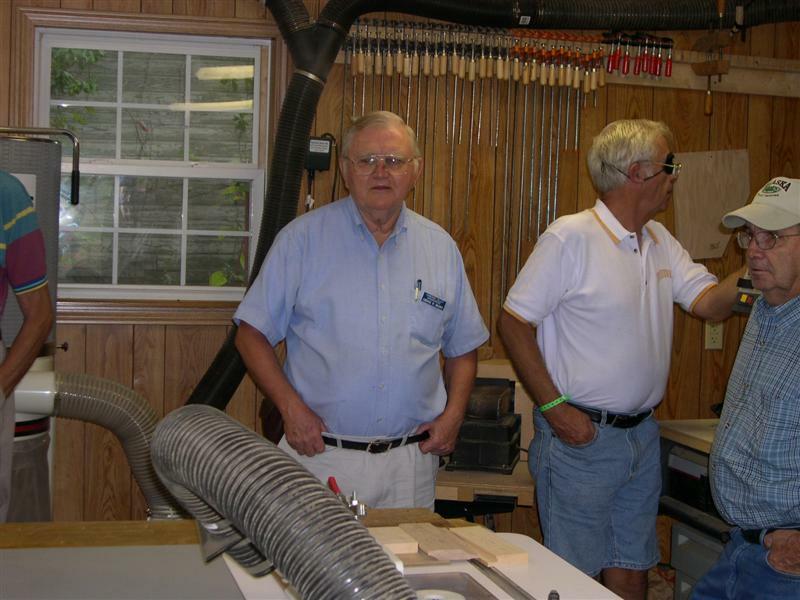 Tom Gillard showed a sailboat tiller, from glue-up to the finished product. He also brought a scythe (made by the Marugg Company) and pictures of a pulpit and emblem he had built. Lip service: raising the front of a curved shelf When building a shelf, sometimes you would like to raise a lip on the front edge to keep items from sliding off. That’s easy on a straight shelf, but more difficult on a curved piece. Here is a method that works well in most cases. First, cut the shelf to shape, but oversized to also include the width of the lip. Next, rout a decorative profile on the edge of what will become the lip piece, then bandsaw this piece from the front of the shelf. Now, without sanding the second cut, re-glue the lip piece to the shelf, raised slightly to create the lip. DRILL PRESS: A tall upright machine useful for suddenly snatching pieces out of your hands so that it smacks you in the chest and flings your “drink” across the room, splattering it against that freshly sprayed woodworking project you just finished.